Looking back over my blog posts from last year, I noticed that I had completely failed to write about St. Patrick's Day. Allow me to correct that shocking oversight. Last year I celebrated like a tourist. I went into town and saw the parade, a nice event but small and subdued compared to what goes on in Chicago and New York, even when augmented by some American marching bands. And I went to Temple Bar. Well, I stood on the very edge of Temple Bar, the cobbles sticky under my feet from a weekend's worth of spilled beer. I surveyed from a distance the teeming mass of intoxicated revellers as a trio of teenage girls staggered past through a puddle of vomit, leaning on each other as they struggled to stay upright at 4 o'clock in the afternoon. I decided that was quite enough of that and headed home. This year I'm celebrating like a Dubliner by having nice lie-in, indulging in a relaxed brunch, and staying as far away from the city center as possible. With Paddy's Day on a Tuesday this year a lot of people took Monday off as well and used the opportunity to get out of town, out of the country even, and leave Dublin to the visiting Americans who think drinking 7 euro pints of Guinness in a jam-packed pub is great craic. I'm still in town though, and having a great St. Patrick's Day at the Irish Beer and Whiskey Festival just 10 minutes from my house, blessedly free both of overpriced Guinness and of trashed teenagers. St. Patrick's Day is a strange holiday, the national day of Ireland but celebrated more intensely elsewhere, in places like America and Australia where Irishness has meant more for being few among many, and where St. Patrick's bringing Christianity to Ireland started to be less about Christianity and more about Ireland. (The thing about banishing the snakes is a myth, since there never were any snakes in Ireland to begin with.) The transition from Catholic holy feast day to secular national holiday was pushed through mostly by emigrant populations overseas; there weren't regular Paddy's Day parades in Ireland until the 1970's, when they were adopted from the celebrations Americans had been holding for a century. St. Patrick's Day was even a dry holiday for decades in Ireland with pubs legally forced to close, as odd as that seems looking at celebrations now. Nowadays the Irish government regularly spends St. Patrick's Day abroad, using it not as a time to celebrate with their own citizens but to promote Ireland elsewhere as an investment and tourism destination. This is especially true in America, where every year the Taoiseach uses his national day to go to Washington and present the President of the United States with a bowl of shamrock. 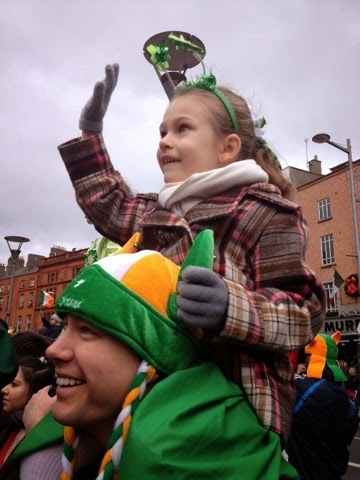 Here in Dublin a lot of the celebrants are not Irish themselves but come from other places to be Irish for a day, even as the Irish barricade themselves in their houses or hit the road to spend their national day somewhere, anywhere else. Not just the Irish national day, it's the Irish international day, both more and less than you might imagine it to be. But despite my cosmopolitan veneer (and intolerance for wasted teenagers) I still am a tourist deep down and I love a holiday for any reason, so here's a toast to St. Paddy's Day and Ireland and leprechauns and all that jazz. Sláinte!